tion on natural habitats in the management of warm temperate forest. could be a good attribute for assessing forest wildlife habitat. broad-leaved forest has yet to be investigated. heterogeneous broad-leaved and coniferous forests. erous species are Japanese cedar (Cryptomeria japonica D.
cies of broad-leaved trees are present, including Quercus spp. glauca Thunb.) and Japanese maple (Acer palmatum Thunb.). Study area and distribution of sample plots. can be identified in addition to the shrub layer (Shidei, 1974). pass survey (Tracon LS-25 surveying compass; Ushitaka Mfg. tions of the ALS data are listed in Table 1.
this study, because less noise was present in the data. Specifications of the ALS data. 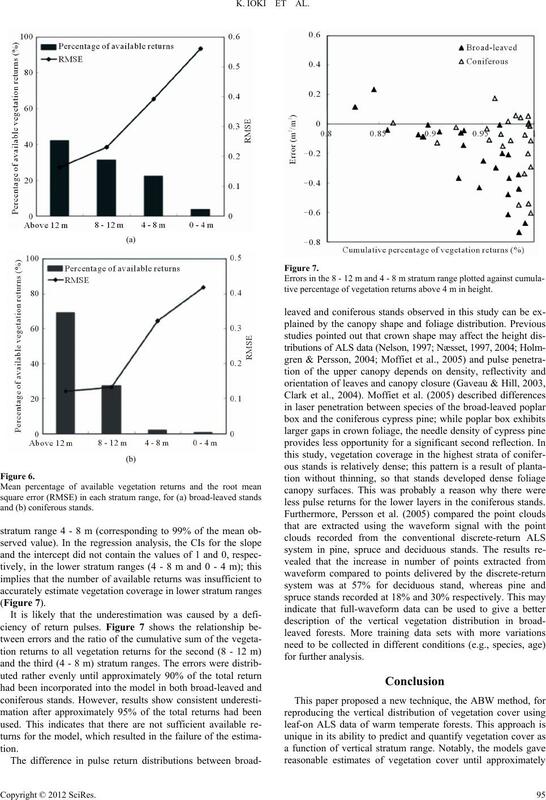 effects of misclassifications of vegetation and ground returns. lar network (TIN) algorithm developed by Axelsson (2000). Table 2 shows parameter settings of the ground classification. Parameter settings used for the classification of ground returns. quent detections that follow the first detection of objects. was 0.164, corresponding to 37% of the mean observed value. 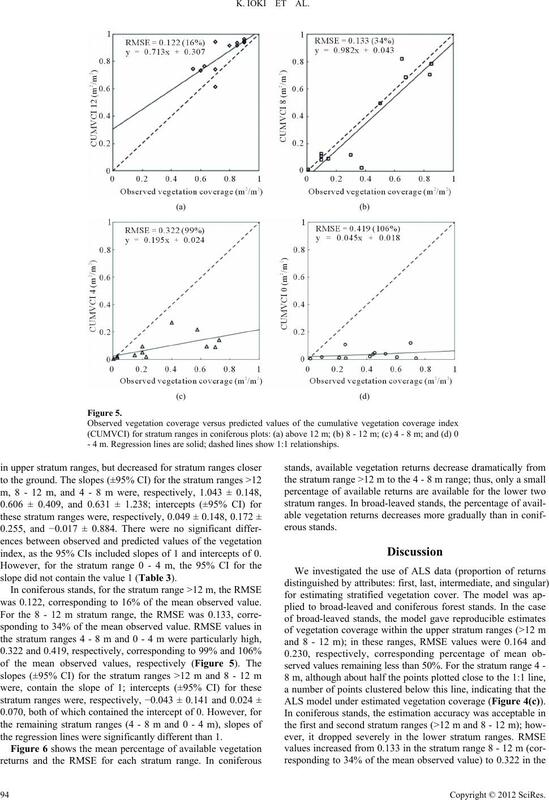 Results of linear regression analyses for each stratum range in broad-leaved stands. Regressions are shown in Figure 4.
p-value: ***< 0.001, **< 0.01, *< 0.05. 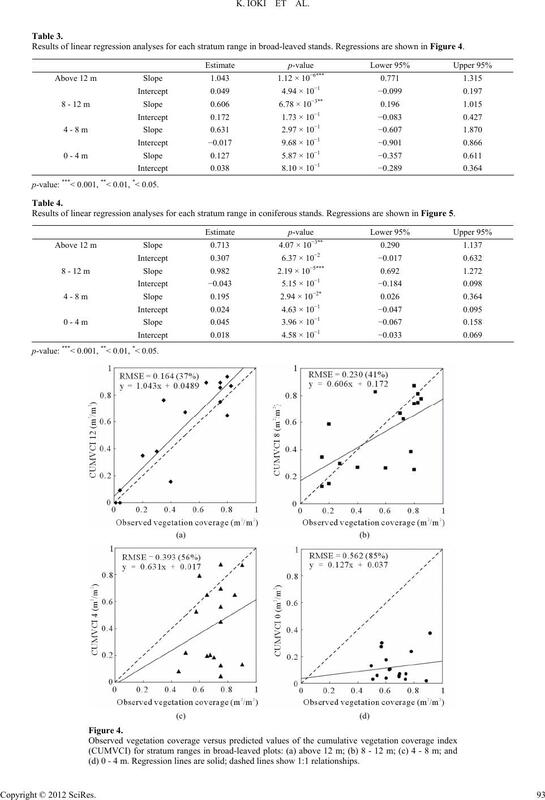 Results of linear regression analyses for each stratum range in coniferous stands. Regressions are shown in Figure 5. (d) 0 - 4 m. Regression lines are solid; dashed lines show 1:1 relationships. - 4 m. Regression lines are solid; dashed lines show 1:1 relationships. index, as the 95% CIs included slopes of 1 and intercepts of 0.
slope did not contain the value 1 (Table 3). was 0.122, corresponding to 16% of the mean observed value. the regression lines were significantly different than 1. ALS model under estimated vegetation coverage (Figure 4(c)). tive percentage of vegetation returns above 4 m in height. less pulse returns for the lower layers in the coniferous stands. 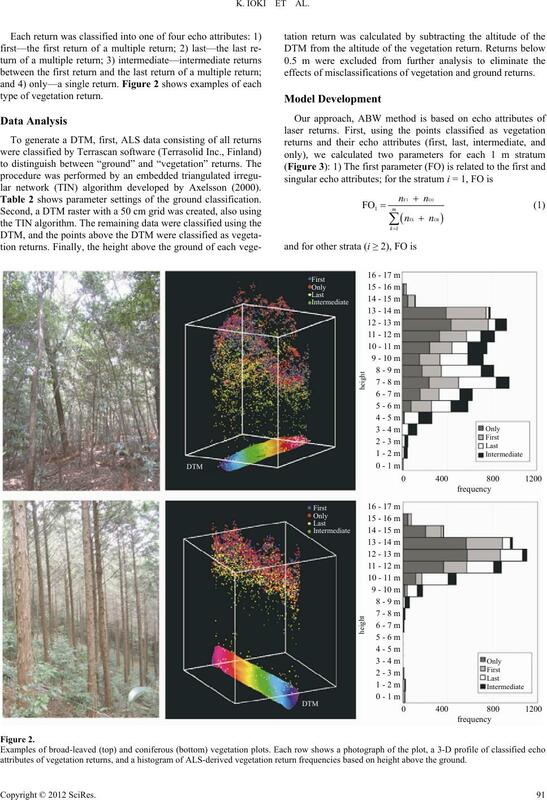 examine the applicability of the model to different forest types. and Remote Sensing, 33, 110-117.
nities (English translation). New York: McGraw-Hill. (pp. 373-399). Cambridge: Cambridge University Press. rain forest landscape. Remote Sensing of Environment, 91, 68-89.
and biophysical properties of Douglas-Fir Western Hemlock Forests. 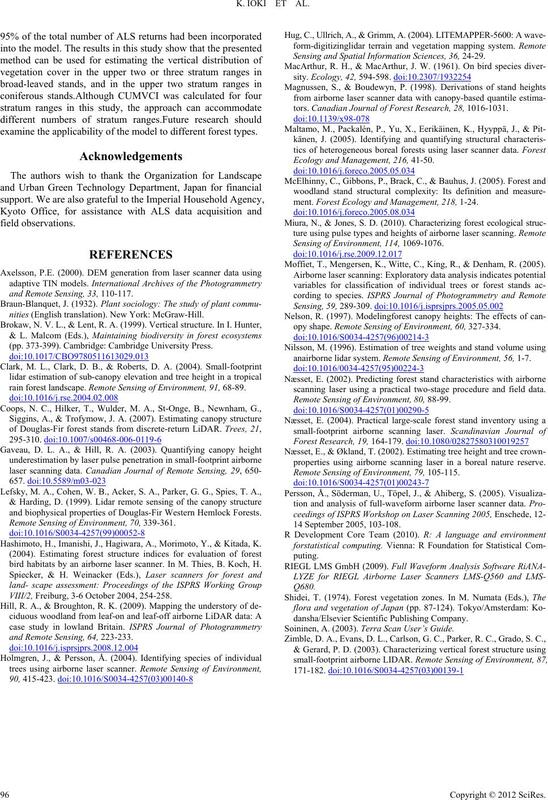 Remote Sensing of Environment, 70, 339-361. 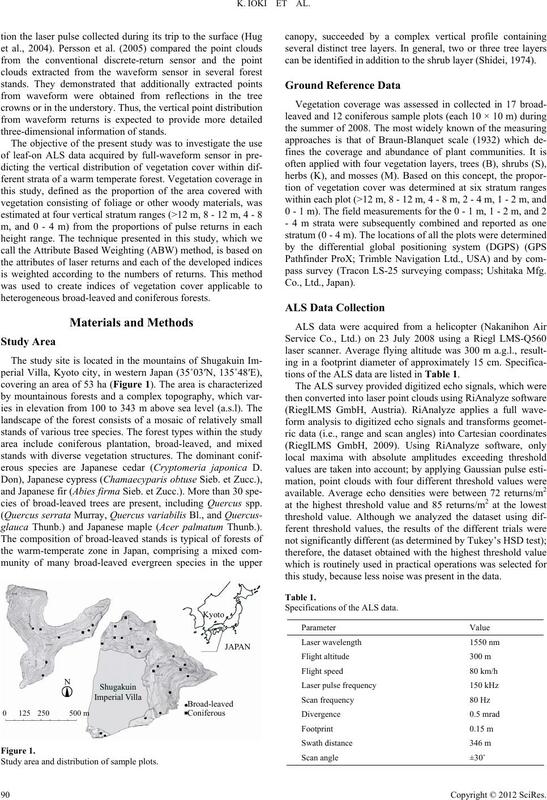 Hashimoto, H., Imanishi, J., Hagiwara, A., Morimoto, Y., & Kitada, K.
bird habitats by an airborne laser scanner. In M. Thies, B. Koch, H.
VIII/2, Freiburg, 3-6 October 2004, 254-258.
and Remote Sensing, 64, 223-233. Sensing and Spatial Information Sciences, 36, 24-29.
tors. Canadian Journal of Forest Research, 28, 1016-1031. Ecology and Management, 216, 41-50.
ment. Forest Ecology and Management, 218, 1-24. Sensing of Environment, 11 4, 1069-1076. Moffiet, T., Mengersen, K., Witte, C., King, R., & Denham, R. (2005). opy shape. Remote Sensing of Environment, 60, 327-334.
anairborne lidar system. 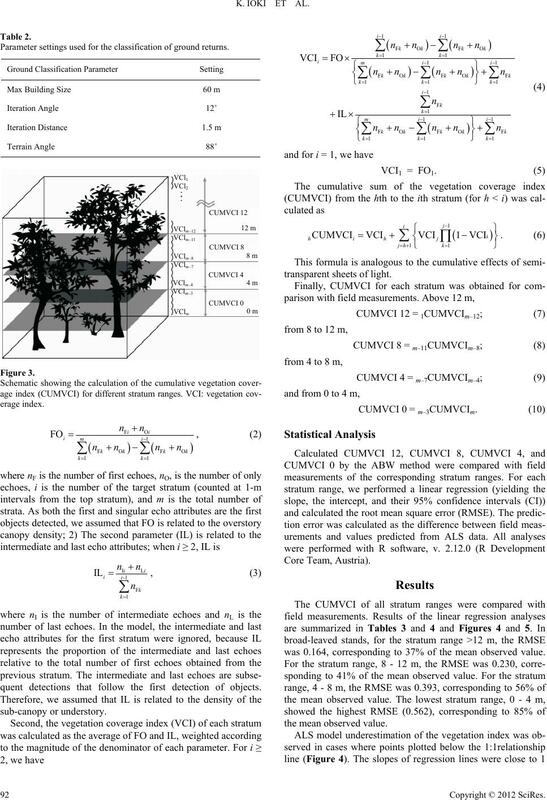 Remote Sensing of Environment, 56, 1-7.
scanning laser using a practical two-stage procedure and field data. Remote Sensing of Environment, 80, 88-99.
properties using airborne scanning laser in a boreal nature reserve. 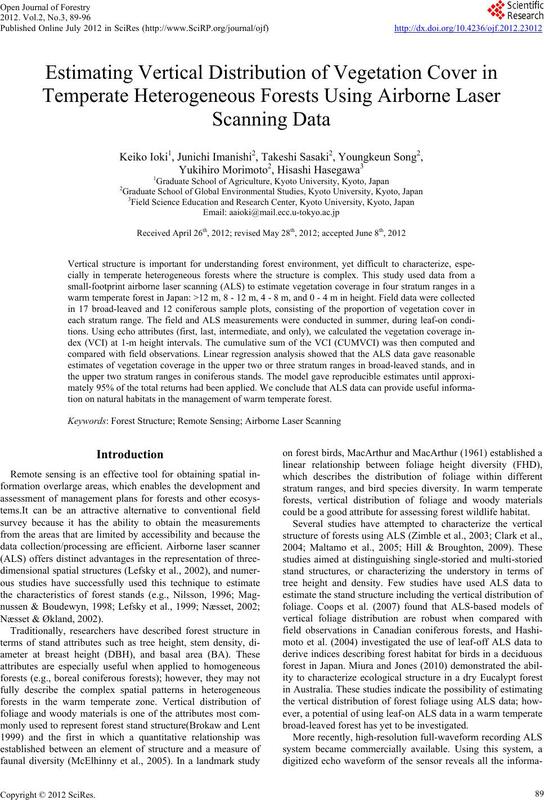 Remote Sensing of Environment, 79, 105-115. Soininen, A. (2003). Terra Scan User’s Guide.